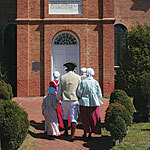 Historical buildings, churches, and landscapes are evidence of our rich colonial history. Named for its central and easily accessible location, Centreville, incorporated in 1794, is the seat of Queen Anne’s County. 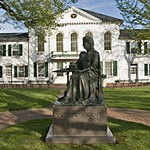 Pre-Civil War and Victorian era styles decorate the town with vivid history. St. Paul’s Church, with communion silver circa 1717, The Tucker House, and Wright’s Chance are all notable examples of 18th century architecture. 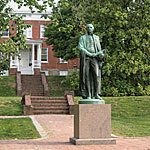 The courthouse located on the central green, is the oldest courthouse in continuous use in the State of Maryland since 1791.
canal, and tours of nearby horse country. 1698 water mill, the foundations of which can be seen along Route 19. St. Luke’s Church (c. 1732) is located on the hill, from which the town derives it’s name. 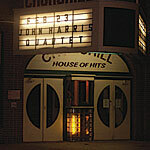 The Church Hill Theatre, built in 1929 as a movie theatre was saved from demolition in the 1980’s and now regularly holds theatrical productions. 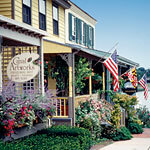 form a historic bed and breakfast overlooking the Sassafras Harbor. 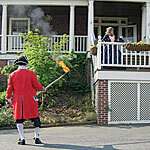 boxwood gardens, nature trails and is open for seasonal tours for an admission fee. tradition. Since 1704, the Catholic tradition has been lived, celebrated and cherished here. 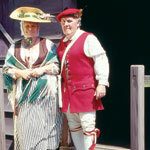 It was one of the earliest Catholic establishments in the English Colonies. The churchyard is noteworthy for the burial sites for several founding fathers of the Catholic faith and that of Kitty Knight, a local heroine of the War of 1812. Also known as “Parvus Urbs Ad Is Aqua” (Little Town On The Water) Historic Queens- town was the first county seat and is home to Queen Anne’s County original colonial courthouse(c.1708). During the Battle of Slippery Hill, Queens-town was the first and only town in Queen Anne’s County to be attacked by the British during the War of 1812. Today, agriculture and seafood harvesting are dominant economic industries. St. Paul’s of Kent is the earliest surviving religious structure in Kent County. It is one of only four 18th century structures on the Eastern Shore to have a semi-circular apse. The Flemish bond brickwork, modillions in the cornice, and other architectural features are exceedingly rare features for this region and are considered extraordinarily fine for the period. 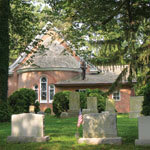 The extensive churchyard covers 19 acres and harbors numerous tree species as well as historic gravestones. The oldest stone is circa 1727. More modern graves include that of Hollywood actress Tallulah Bankhead. Christ Church, (c. 1880) is a lovely example of Gothic architecture; The Old Stevensville Post Office (c. 1870) served the community until 1952 and is now home to the Kent Island Heritage Society; The Cray House (c. 1809) is a rare example of post and plank construction. The Walking Tour of Historic Stevensville guide will lead you to all 23 stops in this historic district.